View More In Meat & Poultry Tools - Page 3. 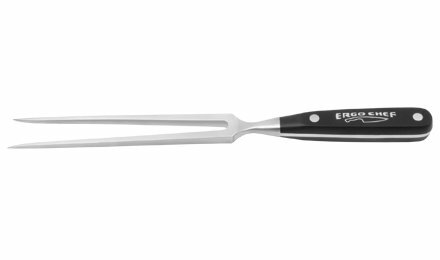 Ergo Chef's Pro-Series 8-inch Fork has tapered, rectangular prongs that come to a point to easily pick up and serve all types of meat. The tongs are made of a solid piece of high-carbon stainless steel for strength and durability. The ergonomic handle allows for a comfortable grip and provides a well-balanced feel. Made of seamless molded Pom, handle is durable and helps control bacteria. Hand wash recommended. By Ergo Chef. The Ergo Chef line of knives is the brainchild of a Johnson and Wales trained chef. The chef was sidelined with painful tendonitis and carpal tunnel syndrome and was desperate to find knives and tools that would eliminate hand and wrist pain. The chef turned inventor enlisted the help of his engineer brother. They worked with designers at the family machining company to examine how a conventional knife fits in a chef's hand, the movement of the chef's wrist and hand during chopping and the angle at which the knife hits the cutting board. The innovative design that was eventually developed took stress off the wrist and hand. After only a few weeks the chef's tendonitis disappeared. Countless prototypes were sent to professional chefs, students and culinary professors across the country. The enthusiastic and positive response gave birth to the Ergo Chef brand. If you have any questions about this product by Ergo Chef, contact us by completing and submitting the form below. If you are looking for a specif part number, please include it with your message.